Me and my brother watched the Professor Layton Movie: The Eternal Diva. Yup, this week has been quite a very "Layton-ed" week for me. After a long wait of 1 year since its release, finally we are able to watch the puzzle professor in his big screen adaption. For me this is an awesome movie, despite the gigantic disaster feel that vibed from it -that actually made it felt dark. The story started after the events of the 1st/2nd game where Layton and Luke, his apprentice solved the mystery of the Big Ben of London. We could conclude this by the appearance of Inspector Chelmy, Barton and Flora. After that, in his office, Layton asked Luke to reminisce of a certain past, when he played a particular music in his gramaphone. It's the song of the Eternal Diva, by one of Layton's former student, Jenice Quatlane -the opera diva. The song took us to an event 3 years passed, when Luke was just a freshman assistant for Layton. Here we are introduced to Remi Altava, the 1st assistant of Layton, because the event occured after the 4th game. Layton received a letter from Jenice, asking for his help to solve the mystery of the Eternal Life from the lost city of Ambrosia. The two were invited to watch the opera at Crown Peton where lots of high class societtes attended. It was not the opera that intrigued those people, but the fact that the director of the show has offered the Potion of Eternal Life for one of the lucky guest. And so the tragedy started, the show turned into a terrifying puzzle where only those who can answer correctly could move on the a higher level. Lots of people were tricked, and the tense increased greatly. And so finally, Layton, Luke and Jenice are among the 12 lucky contestants, who are brought to a secret island called Ambrosia, where they will try to solve the true meaning of this whole event. 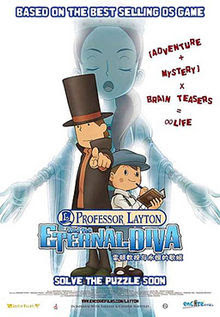 The addition of several, yup only several Puzzles in the movie, headlines the true power of Layton in this movie. To my little perfection, I found that the small number is not really enough, but then again, too much will create draggy atmosphere as well. However, these puzzles were able to make us, at least me and my brother, tried to think of the solution. The CG effects of this movie is awesome, and from the sense of the animation, I can honestly say that the experience was the same as playing the games. For those of you who are Professor Layton's fan, I highly recommend watching this movie. Because this is the 1st of the planned trilogy, and it is really a breakthrough for the franchise. You'll love it if you're a fan!